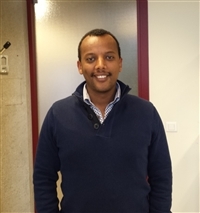 Hailu Gebru Kassa obtained a double Master degree in Functionalized Advanced Materials Engineering from Université catholique de Louvain (UCL), Belgium, and Grenoble Institute of Technology (Grenoble INP), France, in 2009. He obtained a PhD degree in Engineering Science from Université catholique de Louvain in 2014, under the supervision of Prof. Alain Jonas. The main research topic of his PhD was on the electrical and structural properties of nano-imprinted ferroelectric polymers that can be used for the fabrication of low voltage nonvolatile memory devices. Currently, he is a post-doctoral researcher at University of Mons in the field of hybrid organic/inorganic electronics. His field of work includes organic electronics, thin films, polymers, micro- and nanofabrication, and various characterization techniques. Kassa,H. G.; Cai, R.; Marrani, A.; Nysten, B.; Hu, Z.; Jonas, A. M., Structure and Ferroelectric Properties of Nanoimprinted Poly(vinylidene fluoride-ran-trifluoroethylene), Macromolecules 2013, 46, 8569-8579. Kassa,H. G.; Nougaret, L.; Cai, R.; Marrani, A.; Nysten, B.; Hu, Z.; Jonas, A. M.,The Ferro- to Paraelectric Curie Transition of a Strongly Confined Ferroelectric Polymer, Macromolecules 2014, 47, 4711-4717. Nougaret, L.; Kassa, H. G.; Nysten, B.; van Breemen, A. J. J. M.; Gelinck, G. H.; deLeeuw, D. M.; Marrani, A.; Hu, Z.; Jonas, A. M., Nanoimprinted Ferroelectric/Semiconducting Polymer Layers for High-Density Low-Voltage Non-Volatile Memory Diodes, ACS Nano 2014, 8, 3498-3505. Cai,R. ; Kassa, H. G.; Marrani, A.; van Breemen, A. J. J. M.; Gelinck, G. H.;Nysten, B.; Hu, Z.; Jonas, A. M., An Organic Ferroelectric Field Effect Transistor with Poly(Vinylidene Fluoride-co-Trifluoroethylene) Nanostripes as Gate Dielectric, Appl. Phys. Lett. 2014, 105, 113113.